Essential Questions: How does Austen’s use of satirical characterization, irony, and diction create a parodic work? How are parodies used to influence society’s view on a given topic? Objective: Students will be able to define “parody” and begin to develop an understanding of how parody functions in Northanger Abbey. Rationale: Students will analyze Jane Austen’s word choice and their impact on meaning and tone to understand how parody is developed and used in Northanger Abbey while making connections to parodies in the world around them. Students will understand how parodies are used to influence society’s view on a given topic. Students will create an artistic representation of a parody to demonstrate their understanding. Each of these resources provide current examples of parody and satire for students to relate to, and will help them frame their thinking for creating their own parody. Students may look at definitions for each term, then write those definitions in their own words. Students should then examine current examples of parody and satire in order to solidify their understanding of the two, using the resources provided above. Students may use the Parody vs. Satire Graphic Organizer to record their definitions and to make notes as they look at the examples. 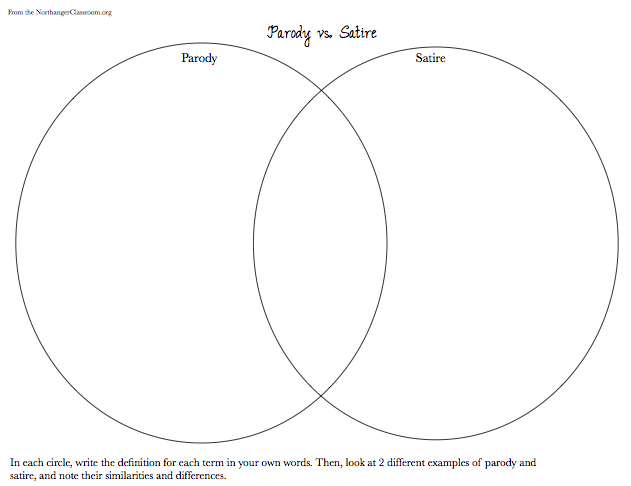 After examining the differences and similarities for the two terms, students may create a visual representation of their understanding of parody. Encourage students to create their own parody in the forms of political cartoons, movie posters, videos, songs, etc. This assignment may serve as scaffolding for a larger, cumulative assessment on parody for the unit. After developing a firm understanding of parody, students may then apply their knowledge to the text of Northanger Abbey and begin to examine how Austen’s use of satirical characterization, irony, and diction create a parodic work. The teacher may read aloud of first chapter of Northanger Abbey, discussing pardoic elements along the way. This will help students begin to familiarize themselves with Austen’s prose, and the teacher may act as a guide for deciphering the text and noting how Austen creates a parodic work. The digital, interactive text may be found at The Text of Northanger Abbey.org. How is Catherine introduced to the reader? What is the impression that we get of her? What do we notice about the narrator? What kind of tone do they have? For more information on accomplishments and education, see “Education and accomplishments” by Gary Kelly from Jane Austen in Context (can be read through link to Google Books). Discuss literary heroes and how Catherine relates to them.